When you’re getting ready to move, making sure that your TV is properly packed helps lower the risk of damage. Packing this kind of item improperly means that you can end up with a broken or cracked screen or other damage that forces you to replace it or try to have it repaired. 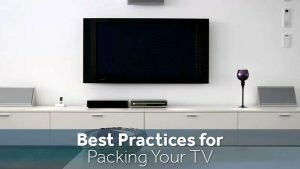 Use these tips on best practices for packing TVs, so you’ll be all set for moving day. Before packing up your TV, make sure that all cords have been removed from it and are safely stored away. Wipe down your TV to get rid of any dust that’s accumulated on it. This way, you won’t be bringing any dust into your new home. 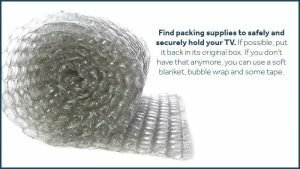 Find packing supplies to safely and securely hold your TV. If possible, put it back in its original box. If you don’t have that anymore, you can use a soft blanket, bubble wrap and some tape. Whether you have an LCD TV or another type of flat-screen TV, keep it upright while packing it up. Cover it with a soft blanket, then put a couple of layers of bubble wrap over the blanket and hold these together with tape. This helps keep your TV safe from damage while it’s in the moving truck. Always have someone else help you carry your TV onto the moving truck, so you won’t drop it or hurt yourself. Carefully lift it up, then place it in a secure spot where it won’t have anything fall over onto it. Don’t put anything on top of it, and avoid placing it on top of other items, since it could tip over. If possible, store it between two mattresses to hold it in place without the risk of damage. If you’re uncomfortable packing up your TV and having to move it onto a truck, consider hiring a moving company instead. At Zippy Shell, our movers know how to pack TVs and other delicate items to keep them safe. When you hire us to help you out, your move will be less stressful and more affordable. You also won’t have to worry about renting a truck and finding other people to help you load and unload it. Whether you’re moving locally or long distance, Zippy Shell Greater Columbus is here to help. Our movers can carefully pack up your TV and other fragile items, load them onto our truck and get them to your new home safely. Local moves start at just $499, while long distance moves start at just $999. Call us today to get started!